Art Business News. ArtExpo 2007. Mark Allen Fine Art experienced “mixed success” with some of the new artist ventures the company showcased at Artexpo this year. The company brought two new artists to the show and displayed a new realistic style of work by Vadik Suljakov, an established artist best known for his impressionist paintings. Although some new initiatives received mixed reviews, others came forward as trendsetters for 2007. METAL ART was a recurring theme in several exhibitors’ booths, as many artists experimented with works on a new substrates for the show. New exhibiting artist A.D. Cook showcased a wide range of his metal fusion art, which is intricately hand painted, airbrushed and even etched with a razor and other sculpting tools to create visually striking images. In addition to Cook, Artera Fine Art’s oils on canvas with steel by Christopher Webb; Reyna Castano’s mixed-media works on canvas and metal Corinne Dauger’s oils on oxidized zinc; the high relief/mixed-media and bonded-bronze works of Bill Mack (Erin Taylor Editions0; Jacques Soussana Graphics’ laser-cut, hand-painted steel pieces; Jason Mernick’s painted stainless-steel and copper creations; and the many sculptural works showcased by Masterpiece Publishing, Studio Fine Art, Art Guion XXI Gallery and others, were just a sampling of the metal-inspired masterpieces on display. 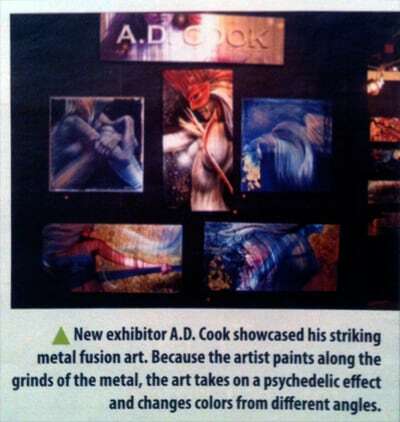 New exhibitor A.D. Cook showcased his striking metal fusion art. Because the artist paints along the grinds of the metal, the art takes on a psychedelic effect and changes colors from different angles.